Middlesex University's London and Malta campuses have come together, along with Kingston University, to establish the Mediterranean Observatory on Migration, Protection and Asylum (MOMPA). 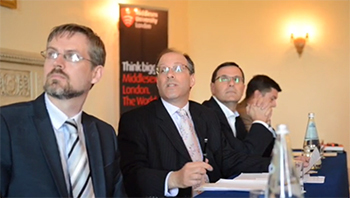 MOMPA was officially launched today (9 June) by Professor of International Politics Brad Blitz, Senior Lecturer in Law Dr Anthony Cullen and Kingston's Dr Ian Greatbatch at a press conference in the Maltese capital Valletta. They were joined by Martin Xuereb, who is the director of the Migrant Offshore Aid Station (MOAS), which has rescued almost 6,500 migrants from the Mediterranean to date. With the migrant crisis in the region showing no signs of abating – Royal Navy ship HMS Bulwark rescued 1,200 migrants on Sunday alone – MOMPA's aim is to collate and analyse data on the flows of migrants, enabling better information sharing that can then inform European-wide migration policy. "The need to coordinate services, gather and analyse information is obvious from both the EU and humanitarian response to this tragedy and the massive numbers of migrants seeking to reach Europe," Professor Blitz said. "We need policies built on evidence and, rather than reacting to events, we need to think ahead." Dr Cullen (pictured far left alongside Professor Blitz) added that not only is there a moral obligation to assist migrants but there is also a legal obligation. Citing, among others, the International Convention for Safety of Life at Sea and the European Convention on Human Rights, he said: "The prohibition of refoulement – that is not returning migrants to situations where they may be subject to persecution or placed in harm's way – is absolute." Mr Xuereb said that while MOAS remains a search and rescue outfit, they feel an obligation to ensure that policy-makers take informed decisions, and therefore the partnership with Middlesex and Kingston universities will enable them to address a knowledge gap. "We need to pass this information through a sieve, analyse it and send it on to the world in a way which is useful," he said. At the same time as Professor Blitz and Dr Cullen are in Malta, three of their colleagues from the School of Law – Dr Elena Vacchelli, Dr Alessio D'Angelo and Dr Nicola Montagna – are visiting Lampedusa and Catania in Sicily, where many of the rescued migrants are taken, on a fact-finding mission. Middlesex has also secured funding from the Centre for Academic Practice Enhancement and the Erasmus+ programme to send a number of students from the Schools of Law and Media & Performing Arts to work with MOAS over the summer assisting with its Migrant Report project. You can follow all the latest updates from the Middlesex team in Malta and Sicily on Twitter using the hashtag #MDXmigration.